We left Chris’ dad and step mom, Mik and Laura, in Falmouth Harbour and said goodbye to Antigua for good. It had been our home base for two months and we had become very comfortable there; therefore it was time for a change. We left around 9:30 am and arrived in Deshais, Guadeloupe around 3:15. In the 2.5 weeks Mik and Laura were with us we never made it above 8 knots, but on this passage we cruised on a broad reach at an average of 8 knots. 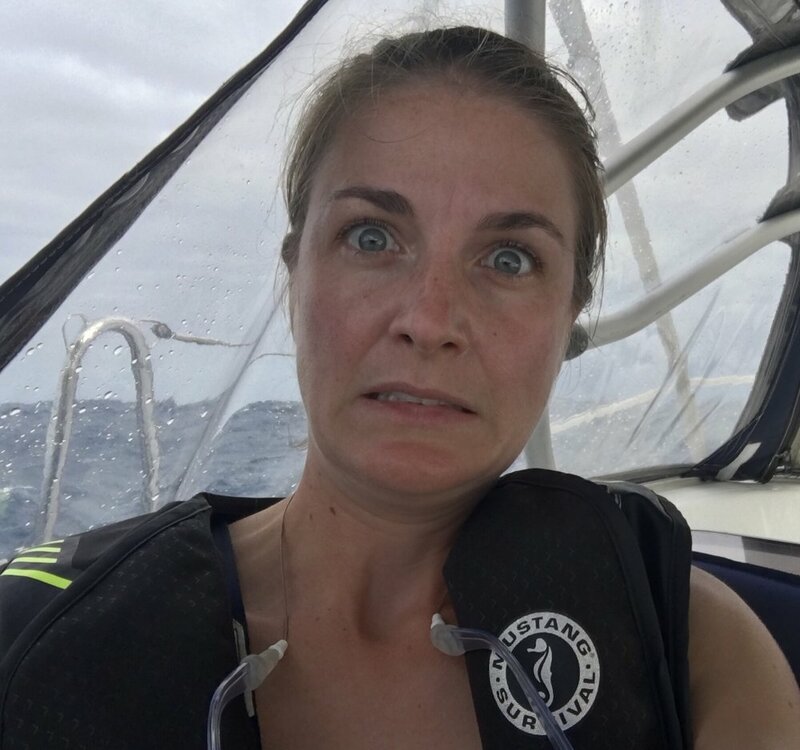 We sailed at full hull speed and even made it up to 10 knots at one point as we surfed down a wave. Upon arrival we met up with some friends from the boat “Our Alibi”, Clint, Heather, their son Ty, and their sailing instructor George. Having not slept the night before, and from the emotional, teary morning saying our goodbyes to Mik and Laura, I was tired but it was so nice to have our new friends over for drinks, appies and swapping newbie Caribbean cruiser stories. I wish we could have spent more time with them but who knows, maybe we will meet up again somewhere south. There was an upside. 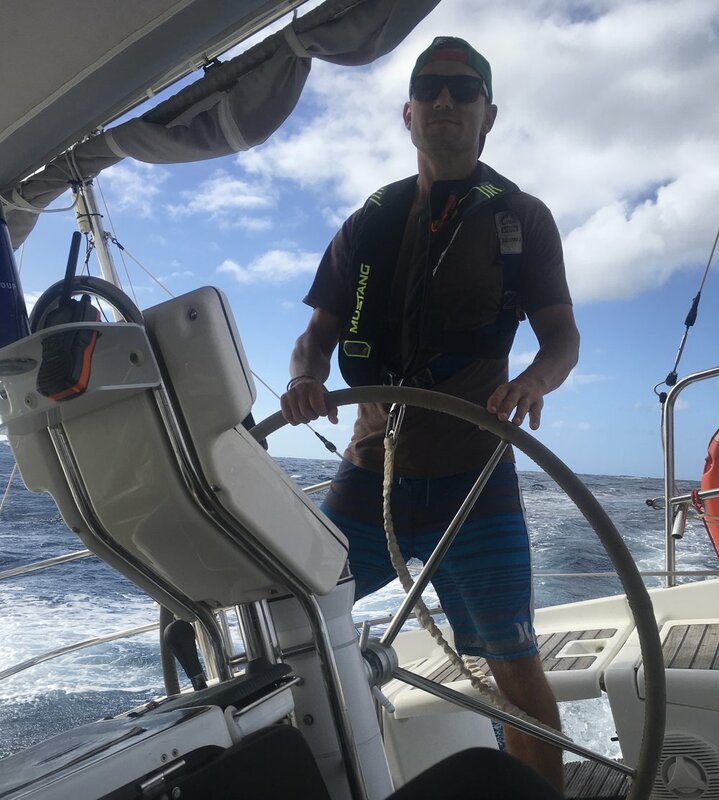 We had light wind along the west cast of Guadeloupe and normally we may have motored but because we had no engine our speed was roughly 3-5 knots. This turned out to be the perfect speed for dolphins. There must have been at least 15 of them swimming and dancing around our bow. I can’t describe how magical it was. I yelled for Chris to come up from the engine room and we shared this incredible gift. We were lucky enough to see dolphins twice during this portion of the trip and then once again when coming into Martinique. As the sun went down the wind picked up. 5 knots of wind, 20 knots, 30 knots of wind; we were flying. We started with one reef in the the main sail (we made the sail slightly smaller to catch less wind) and quickly made the decision to put in a second reef. It wasn’t even done and we had to quickly reef the genoa too (we furled up a portion of the front sail) so much so that you couldn’t see any tell tales on the sail. Despite this we still managed to go hull speed and faster at times. I was both terrified and exhilarated, we really felt like a team and Chris’s calm yet direct instructions gave me confidence that we could accomplish anything thrown at us. Unfortunately for us, there were a few hiccups. The stopper knot in the genoa had come undone and the line slid past the cleat and was flying uncontrollably in the wind. Chris clipped into his safety harness and went onto the deck to fix it - this was while we were heeled over in the rain, with gusting winds and an inky black sky. I was a little nervous to say the least and kept yelling at him to talk to me so that I knew he was still there, but he did come back to the cockpit successful and we carried on. We took 2 hour shifts with Chris taking the first shift. I was not able to sleep as I felt the need to have eyes on him at all times. As well, during my shift I had a hard time doing anything but look at the instruments, sails and surroundings. Chris encouraged me to get out of the wind and only check them every 10 minutes “It’s a marathon not a sprint” he said trying to make me understand that this was a game of endurance and if I didn’t relax then I would have a hard time staying up for the full night. I agreed and knew this to be true but it was easier said then done; eventually I was able to relax... kind of. As I started my second shift the moon appeared. At first I preferred the black sky to the moonlight, because when I was finally able to see the waves that had been surrounding us they looked quite ominous. However with time, the waves were not scary but beautiful as they sparkled in the moonlight. I gained some confidence during this shift and when I went to start my third shift in the early morning, I was nervous yet excited to pick up where I left off. Unfortunately for me the wind conditions had changed. Chris informed me that as we approached Dominica the wind had died and we were no longer able to use the autopilot but had to hand steer. I had yet to hand steer in these kind of light conditions and found them difficult at first as the sail waffled back and forth and never seemed to fill; until it did but it had back winded. I yelled for Chris to help me. Although we were miles from shore I could still see the land and in my mind with no engine and no wind I was worried we’d drift into shore. Chris assured me we were fine, and did a good job of explaining to me how to use the instruments to read the light wind and steer accordingly. Despite this, in these light conditions we continued to flounder... for hours! We spent 10 hours going a total of 25 NM along the west coast of Dominica (if we could have used the engine this would have only taken 3.5hours). During this time we were blanketed in fog which to me was worse than the dark because at least in the dark you can see the lights of other boats and on land. By noon, the rain had stopped and we were able to get dry. We continued to drift, but if nothing else this was a great learning opportunity for me to practice reading the water and geography of the land to help predict when and where the wind was going to be or pick up. By 2:00pm we were out of the lee of Dominica and hit with both big winds and waves. We quickly took 3 reefs again and clipped into the safety lines. These were the biggest waves I have ever seen and Chris says they are also the biggest he’s ever sailed in to date. They had peaks and valleys. When we were in the valley we were not able to see past the next wave coming. We passed maybe five other boats, and would see them one moment and then they’d be gone only to return again. I joked “we could ski down these waves”. It was a bit unnerving to say the least but surprisingly I did get used to it. Chris handled it like a boss and I had total confidence in him. We had four hours of these conditions and although Chris is both mentally and physically strong I could tell that it was starting to wear on him physically. He started stretching and bending to try and loosen his tight back and stated that his hands were starting to get a bit crampy. Sailing into Martinique was beautiful. Dark clouds covered the top of the volcano, Mt. Pelée, yet the setting sun shone like a fireball. It lit up the lower half of the mountain, showing all of its definition in different shades of green. Both of us were a bit worried that when we got into the lee of Martinique the wind would die, as it had with Dominica, and without the engine we would end up floundering in the dark for hours. Lucky for us there was wind and the gentle breeze guided us down the west side of the island. As we approached the anchorage in the dark, we discussed the procedures for anchoring without the engine to steer us in. When we got there I furled the genoa and then we dropped the main. I ran to the bow and Chris turned on the engine just long enough for us to use the windlass to drop the anchor and then he turned it off. Then we waited for the chain to tighten and it did... Whew, we were hooked! I cleaned up the lines, closed the sail bag and locked up for the night and Chris collapsed into bed and did some stretching. After a quick bowl of soup (we were too lazy and tired to cook) we both went to bed for some much deserved sleep.